Everyone has their own way of preparing for winter. 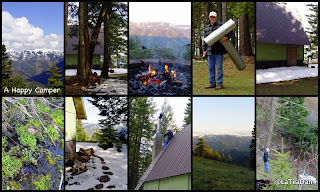 For my husband, a simple task like fabricating a new chimney for the cabin makes him a 'happy camper'. As long as the wood stove can be cranked up to full heat and the cabin cozy, I'm happy too, especially if I have a fun needlework project nearby. With the arrival of autumn, hand-crafts and projects become more important, as gardening and summer chores wane. My friends are pulling out their knitting, quilting, and sewing projects. It's time for me to do the same. A new idea, now and then, helps as well. Look at these beautiful 'autumn leaf' wool felted pot holders! They are simple, colorful, and easy to stitch. While you are at the Design . Sponge blog be sure to take a look at their very creative project for a patterned tea lover's cup. Cute, huh! If you have a second, I'd enjoy reading what types of projects you have planned as the weather gets chilly. Please leave a comment so we can get the ideas flowing! This week has been a crafty week of sorts. I finished 25 soldered charms, started making Christmas cards, and prepared a postcard to be sent in the mail today for my Holiday sale. Ok, can I go out and play in the crisp autumn day now? Oh, I even sat down and hand quilted for a few hours last Saturday. I always get in the mood to pick up a needle when the weather gets cool. So far I've embroidered a horse and a ballerina for two of my nieces, and will eventually turn them into pillows for Christmas gifts. Right now I'm stitching myself some days-of-the-week towels with Scotties doing chores, very cute. Thanks for the potholder link, I love crafting with wool felt! I'm going to learn how to crochet this winter, and I want to try some new recipes! I'm looking forward to the cooler weather and evenings with a hot cup of cocoa and a good book! Loved seeing the cabin again! I'm hoping to do a bit of quilting, knitting and maybe some cross-stich embroidery. I'm going to make special pillowcases for each of my grandkids as part of their Christmas gifts. I have chosen fabrics that are specific to each of the kids and hope to have them be a fun thing for each of them. I also want to make some different pillowcases to keep here at home for times when the kids spend the night. I'd like to have a bunch of different ones - holidays and themes - so they can choose their pillowcase each time they come. First I have to paint and clean before new carpets arrive! I won't forget to sit and enjoy tea in the middle of the madness!